Apple never disappoints, when all and sundry talks about it, it comes up to surprise the world with some extravagantly beautiful smart devices/gadgets/iPhones that are rich in appeal and of pure quality. Apple never compromises on its worth and glance, it is although a little high up in the prices but nevertheless a must-have with grace and elegance. Who won’t risk it all when the package is this interesting? So finally Apple has launched iPhone 6S where almost everything is vigorously changed. The already advanced camera feature is coming with a bang, it has more clarity, more depth and more capacity to seize the image to perfection, It takes vivid 4K video, up to four times the resolution of 1080p HD video. iPhone 6s is totally sharp for selfies with the new 5-megapixel FaceTime HD camera whereas there’s 12MP for pictures. iPhone 6S is a speedy thing with its Wi-Fi and LTE, it offers more LTE bands than any other smartphone. Browsing has never been that easy but with iPhone 6S, everything is possible. iPhone 6S comes with natural leather and vibrant silicone cases which delivers stylish protection. And new Lightning Docks in four color-matched metallic finishes permit for laid-back charging. Apple is always spectacular with its security, it keeps considering the privacy issues of people so with the new iPhone 6S, the advanced fingerprint sensor is now twice as faster than the previous iPhone, Touch ID makes unlocking your phone calm and secure. iPhone 6S stupendous design, sleek as ever! iPhone 6S will make its users more astonished than before with its charismatic body. The enclosure is made from a new alloy of 7000 Series aluminum — the same grade used in the aerospace industry. The cover glass is the sturdiest which is the most hard-wearing glass used in any smartphone. iPhone 6S encompasses of a new rose gold finish joins space gray, silver, and gold. 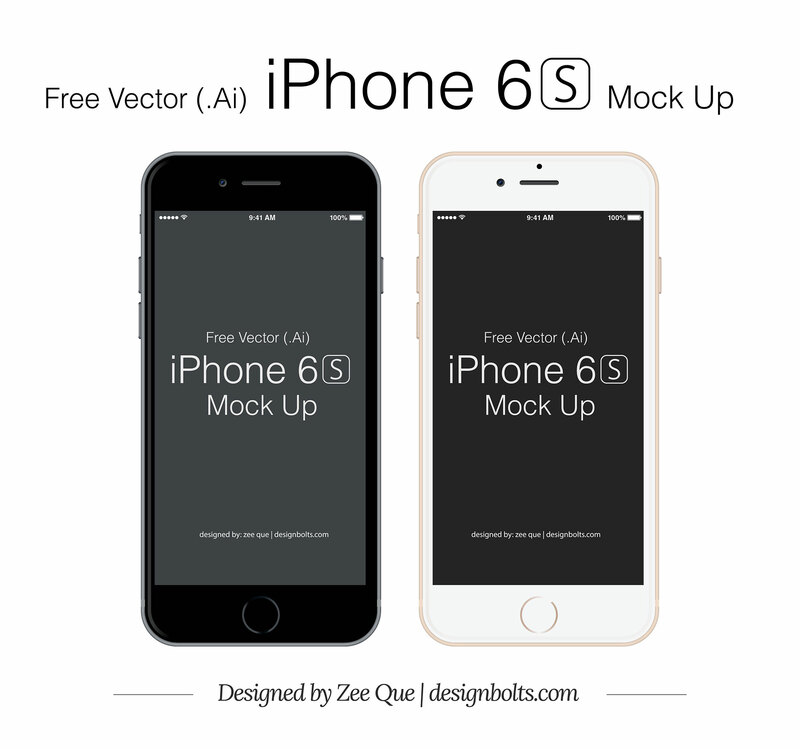 Today I am unfolding before you free Vector apple iPhone 6S mockup. Use this mockup to present an iPhone application. Feel free to write to us. Have a look at the mockup down here. Subscribe us for more tech posts and you will love them in future as well!